Posted by slvrhawk2014 in Travel, Washington D.C. I will not be writing my usual posts for the next few weeks. My husband and I are preparing to leave on a trip to check off an item on my bucket list. I have always wanted to see the cherry blossoms in Washington, DC. Though we have been to Washington several times, as teachers, we had never been able to make it in April. That is one of the things I love about retirement…anytime can be a good time! While away, we will also be visiting our son and daughter-in-law…something to which we always look forward. I will continue to post while we are gone. While I will not be trying any new recipes, I will be eating in new restaurants and seeing new sites. I hope to post information on these things as we go. I also have chosen a vintage recipe that will go well with my trip to see the cherry blossoms. I will post pictures and the recipe when I return home. Very excited about our new adventure! Posted by slvrhawk2014 in Family, Photography, Washington D.C.
Reflections can bring back beautiful memories…and they can bring to mind sad realities. 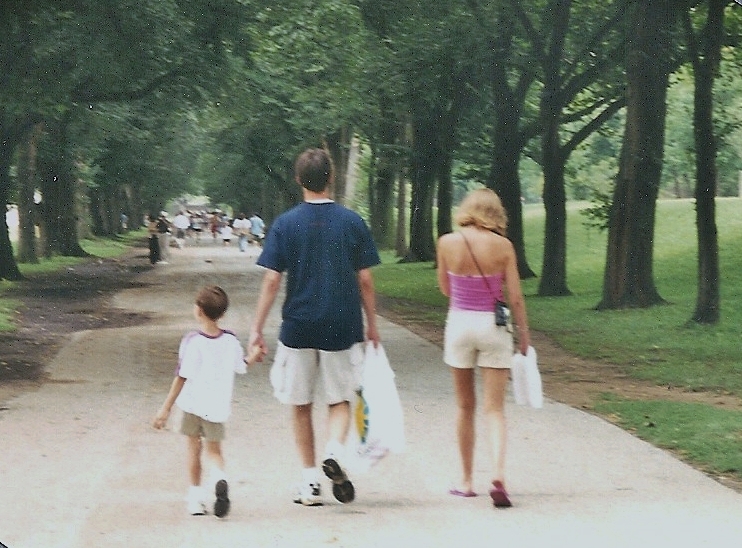 I took this picture of our grandson, oldest son, and youngest daughter during the second week of August in 2001. It is one of my favorite photos, even though it was taken with an old film camera and does not have the same sharp quality I can now achieve with my new digital camera. I have always enjoyed watching my family as they walk ahead of me. They are not as aware of my being there, and I am able to watch the ones I love as they really are and as they really interact with one another when they do not realize someone is looking. My husband and my children laugh at me because of the number of pictures I have of their backs…but I cherish these special pictures, each and every one of them. When this particular picture was taken, our son’s family was vacationing with us in Washington, D.C. As noted above, this picture was taken just one month before the tragic events of 9-11. The kids look so at ease, so comfortable, so normal. We walked and walked that whole day, from one end of the city to the other. The whole family had such a great time on that trip. Nowhere in the farthest reaches of our imaginations did we anticipate what would happen in but a few short weeks. It was a moment of innocence I will never forget and will always reflect upon as a very special time… a time in the life of our family, a time in the history of our nation I will always miss and wish we could recapture. Reflections. Right about now, I am oh so ready for spring. I am ready for warmer temperatures, hikes in the woods that reveal signs of a new season with new life, and I am ready for the flavors of spring and the coming summer. To get the season started, my husband and I took off for northwestern Arkansas, to War Eagle Mill, to Hobbs Sate Park and the Ozark Mountains. The northwestern region of Arkansas is one of my favorite places in the country. 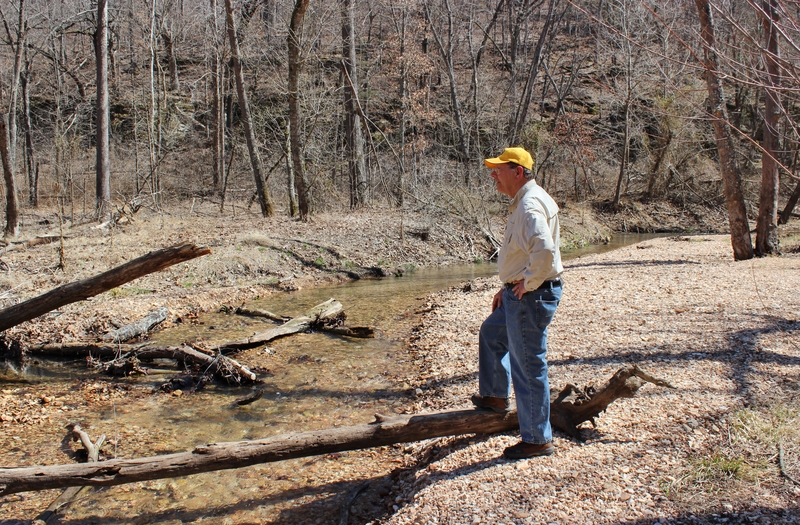 There are many rugged and scenic areas here and a great number of them have been set aside by either the state of Arkansas or the federal government as protected natural areas. Hiking, biking, horseback riding, canoeing, and just taking a leisurely walk along a quiet creek are only a few of the many things to do on a visit to this part of the Natural State. 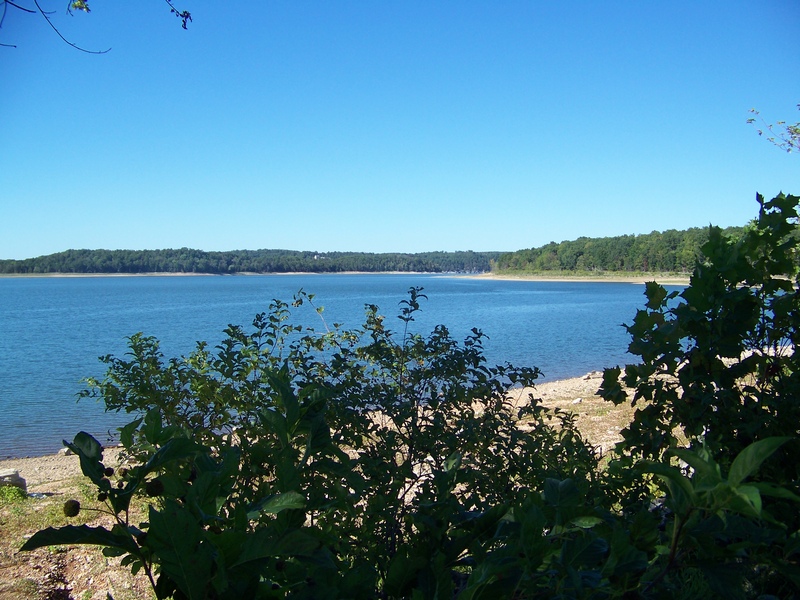 Hobbs State Park is the largest state park in land area in the state of Arkansas. The park is located along the southern shore of Beaver Lake. The lake is man-made, the result of a dam on the White River. Hobbs was once part of a limestone seabed that is constantly being eroded by the creeks found within the park. There are many springs, seeps and disappearing streams that can be enjoyed on one of the several trails in the park. On our visit to Hobbs we chose the Historic VanWinkle and The Sinking Stream Trails. My husband, Jim, looking across the creek toward Van Winkle Hollow and Beaver Lake. 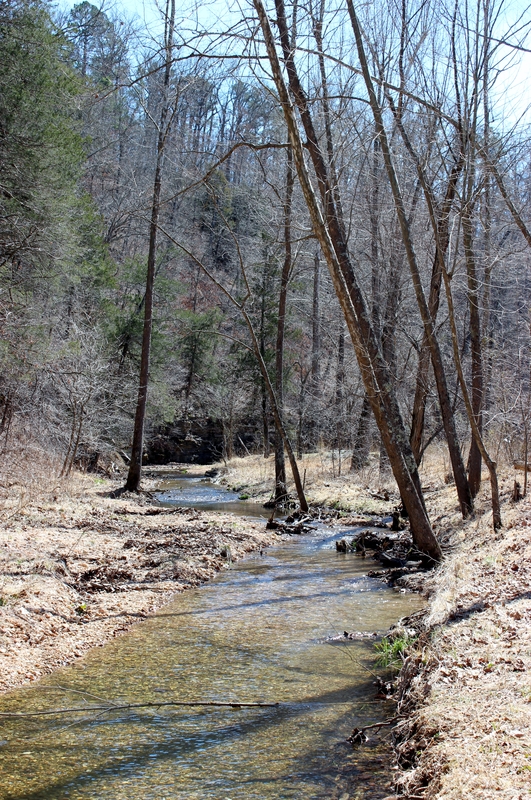 The Historic Van Winkle Trail runs along Little Clifty Creek. It is one-half mile long with interpretive panels along the way to explain the history of the Van Winkle homestead, its lumber mill, and raised garden. 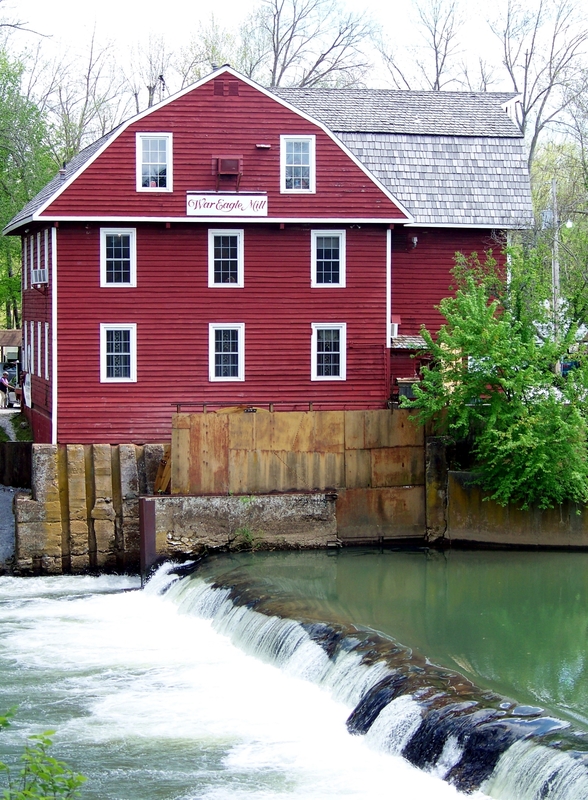 The mill was burned during the Civil War, but came back to life when the war was over. The history of the Van Winkle family is fascinating and gives us a look at how ordinary citizens lived and endured during the war years. The trails in the park are varied; some are longer and more strenuous; some are more primitive; and some are designed for horseback riding. Walking the Van Winkle Trail and the Sinking Stream Trail, also one-half mile long, was easy and still provided us with some good exercise…and we did finally get a small peek of the spring to come. 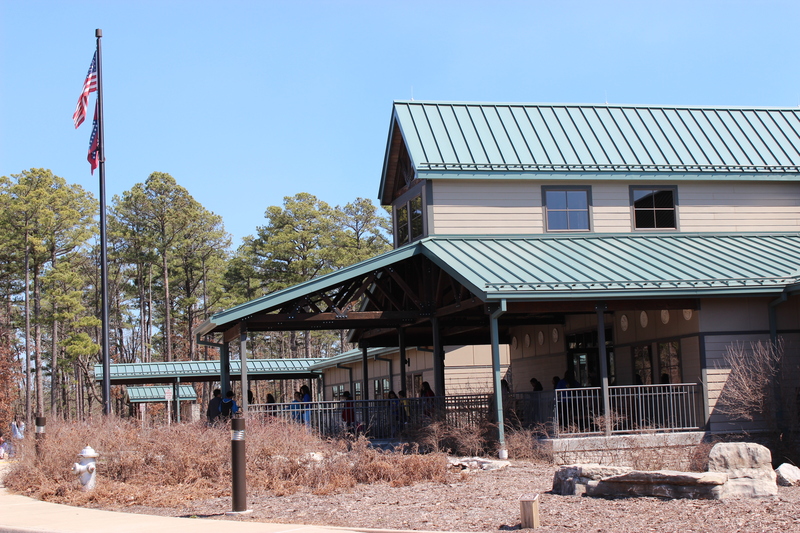 You can learn more about the park by visiting http://www.arkansasstateparks.com/hobbsstateparkconservationarea/#.Uy8pkLROV9a. 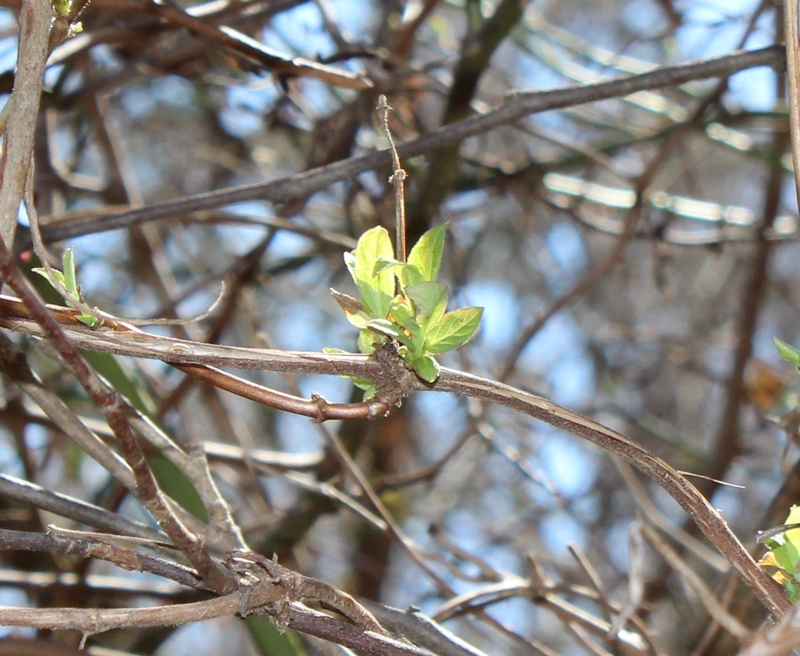 Below are some pictures I took of the promises of new life we saw along the way. New leaves on a vine. 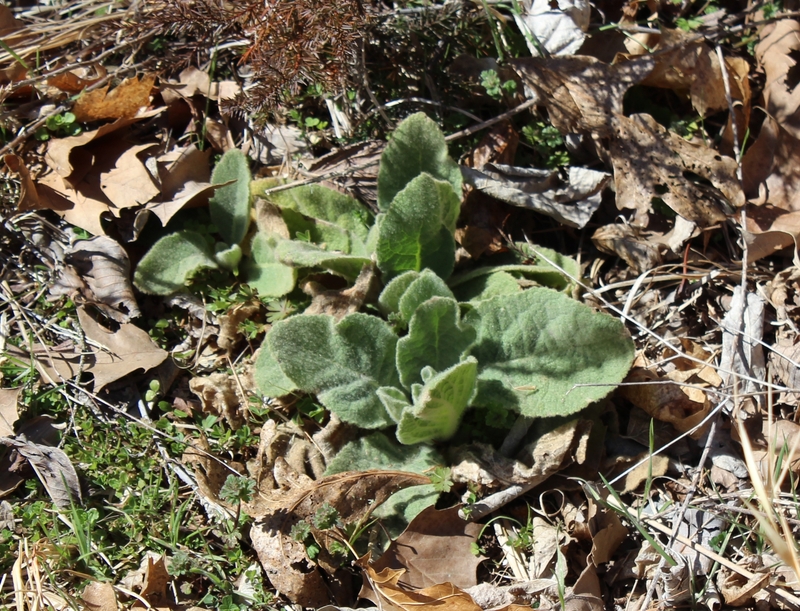 Even Skunk Cabbage gives the promise of a warmer season to come! 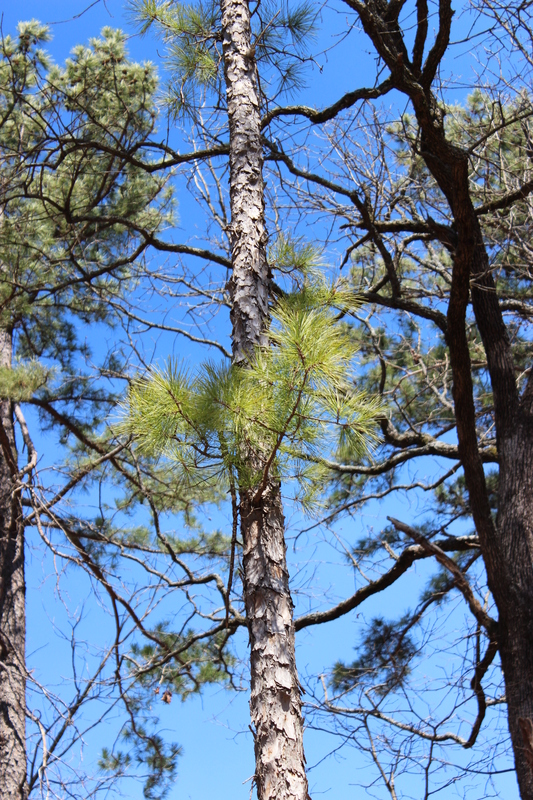 New growth on this loblolly pine. War Eagle Mill is located on War Eagle Creek in War Eagle, Arkansas. 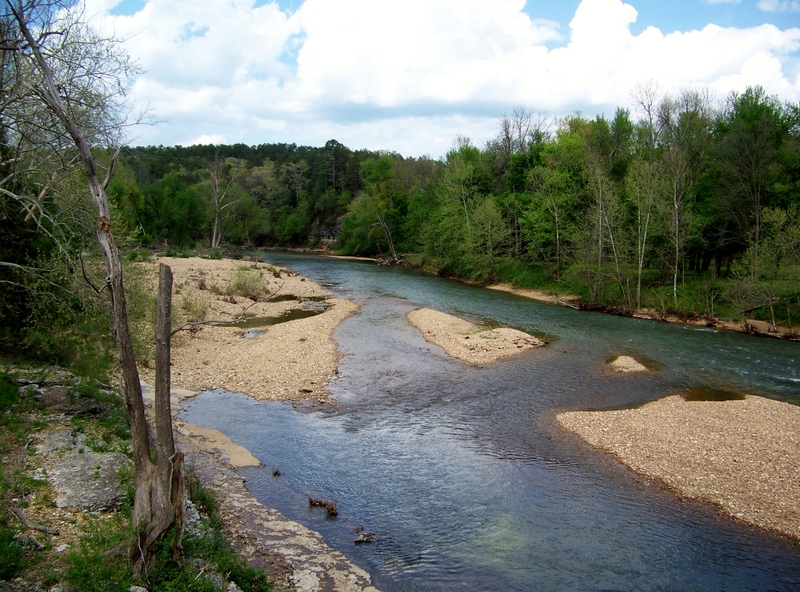 It is right down the road from Hobbs State Park on Arkansas highway 12. A grist mill was built here by Sylvanus and Catherine Blackburn in 1832 to grind corn into flour for their family and for the families in the community. Farmers from the surrounding area would bring their grain to be ground at War Eagle because it was much closer than the mill to which they had been traveling. Over the years the mill had to be rebuilt several times. It was destroyed by flood in 1848, left in ruins during the Civil War, and burned down in 1924. But each time it was rebuilt and restored to working order, serving the nearby community. War Eagle Mill is presently operated by Marty and Elise Roenigk and provides organic, non-GMO natural products on site or by mail. 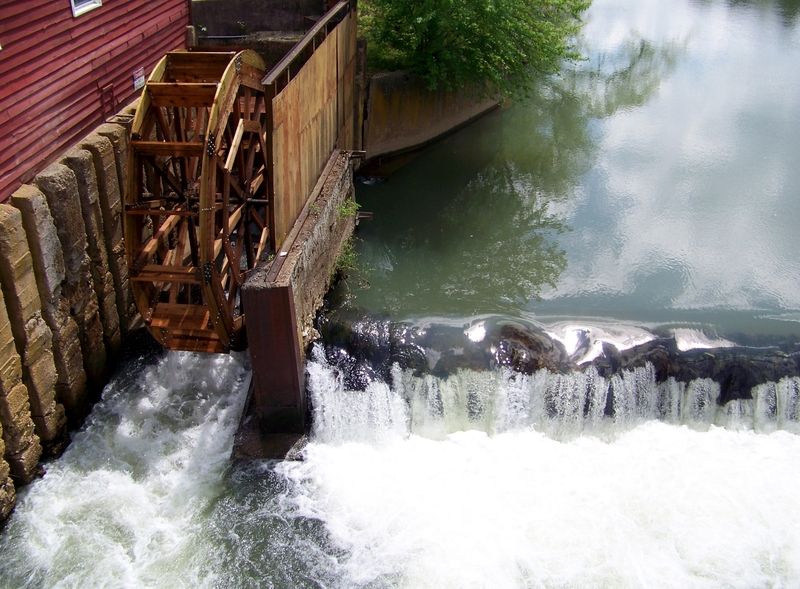 The mill is the only working mill in Arkansas and is believed to be using the only undershot water wheel in the United States today. You can learn more about the mill and mill products by visiting their site at http://www.wareaglemill.com. This bridge over War Eagle Creek is listed on the National Register of Historic Places. 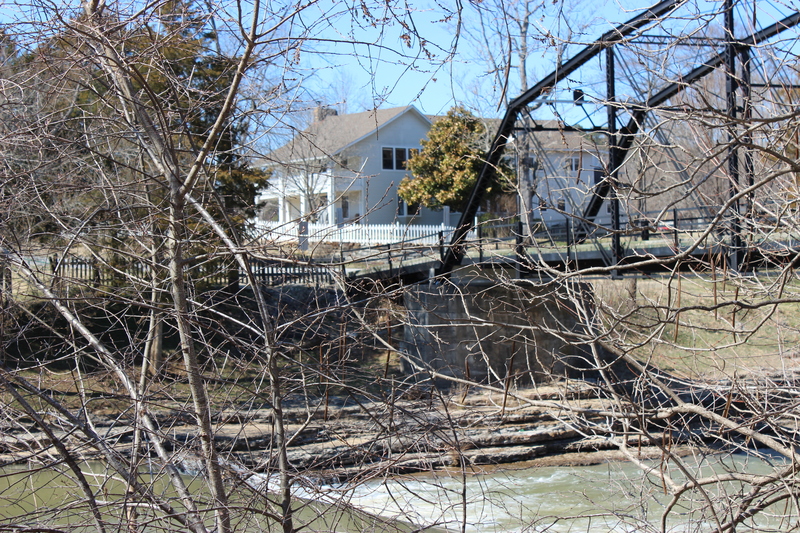 Behind the bridge, you can see the house the Blackburns built for their family in 1832. So, after a good walk in the woods, it was on to the War Eagle Mill to buy some bread flour for the very best white bread recipe I have ever used. Several years ago I purchased a bread bowl at War Eagle and I love to make breads in it for special treats, occasions, or special meals. 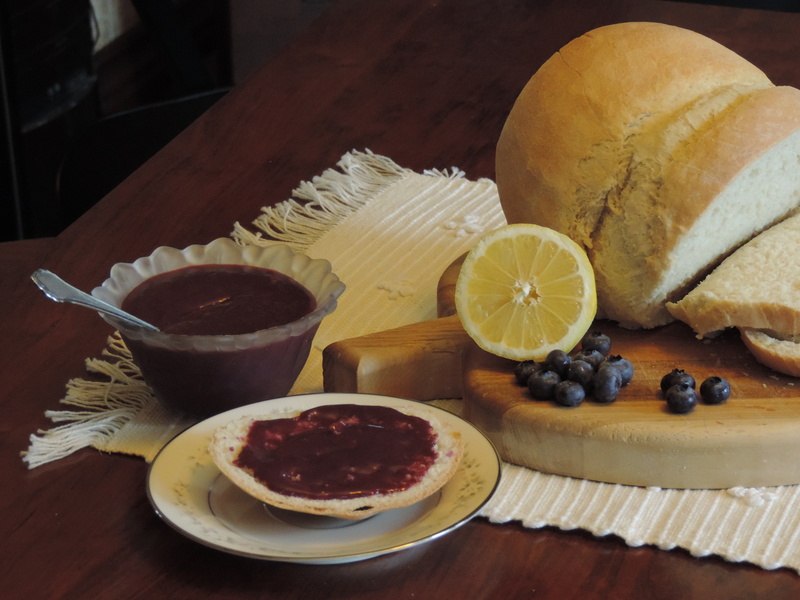 Right now, I wanted it to enjoy with sweet… yes, it reminds me of spring…Blueberry Lemon Curd. 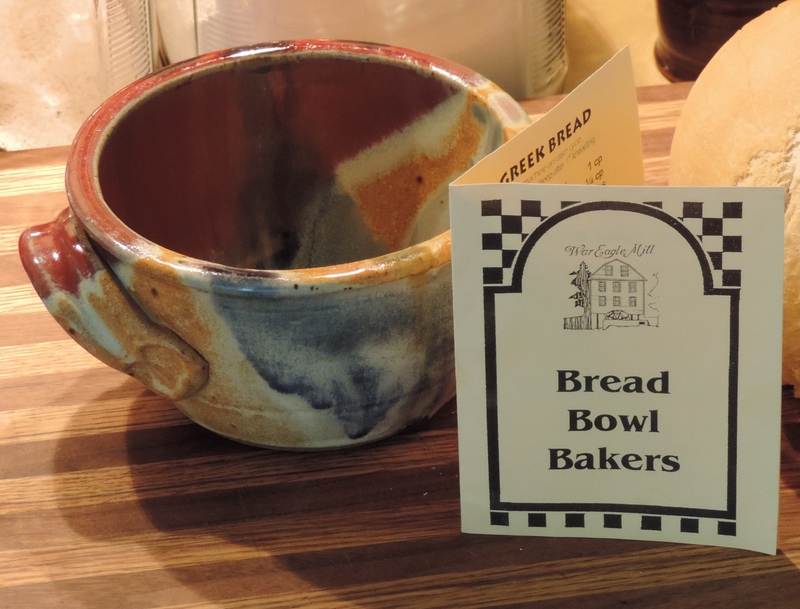 I purchased this bread bowl at War Eagle Mill several years ago. The mill has a gift shop full of traditional cooking items. It also has a restaurant that serves old-fashioned ham and beans, as well as home-made pies. 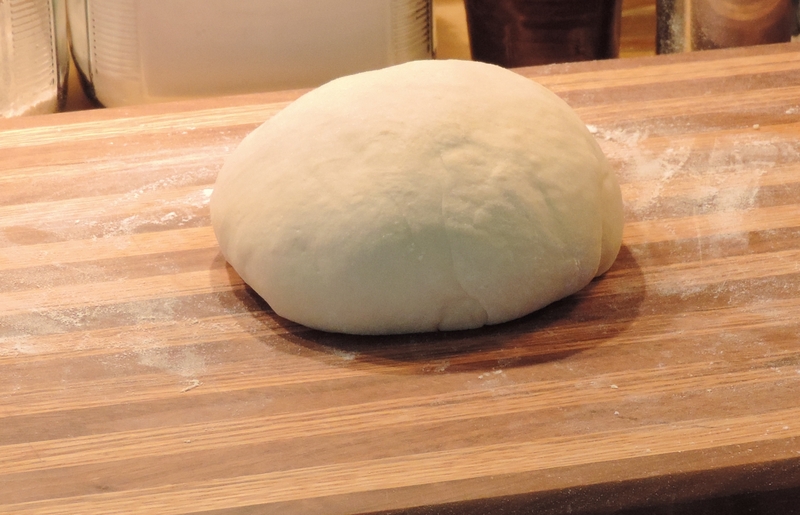 After an initial rise, this dough is ready to go into my bread bowl and to be baked. You can find the recipe I use for white bread at http://www.marthastewart.com/866883/white-bread. Put the berries and the juice of 1/2 lemon in a saucepan. Bring this to boil over a medium heat, then reduce heat to medium low. Cook for about 10 minutes, until the juice has cooked out of the blueberries. Put the berries through a fine mesh strainer. This will give you between 3/4 and 1 cup of juice. Whisk the eggs and the sugar together in the top of a double boiler over simmering water. Mixing the eggs and sugar before adding the other ingredients will begin to warm the eggs and keep them from curdling when you add the warm juice. Add the blueberry juice and lemon zest and whisk until they are well combined with the eggs and sugar. Add the butter, one tablespoon at a time. Whisk the mixture occasionally, especially toward the end of cooking. After about 35 to 40 minutes, the curd should coat the back of a spoon. At this point you should remove it from the heat. Pour the curd mixture into a jar and refrigerate. You can avoid a skin forming on top of the curd by placing a piece of plastic wrap over the surface until it is cold–about one hour. Enjoy! While I am working on a bread recipe for my next blog on food and travel, I decided to submit this picture to the weekly Photo Challenge. I love taking pictures and this challenge offers me a chance to think more about my subject and how to capture it with my camera. 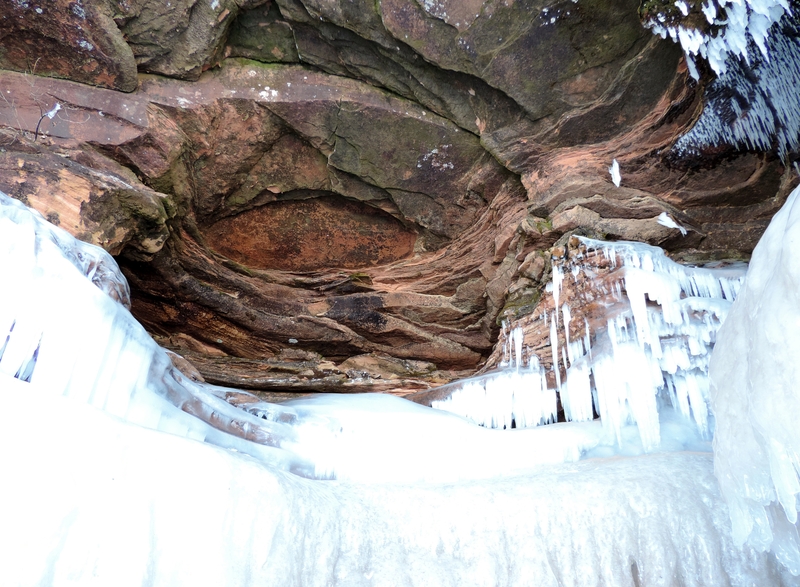 Recently my husband and I traveled to Bayfield, WI to see the ice caves at Apostle Islands National Lakeshore. They were spectacular, and if you ever have the opportunity, this is a place you should visit. 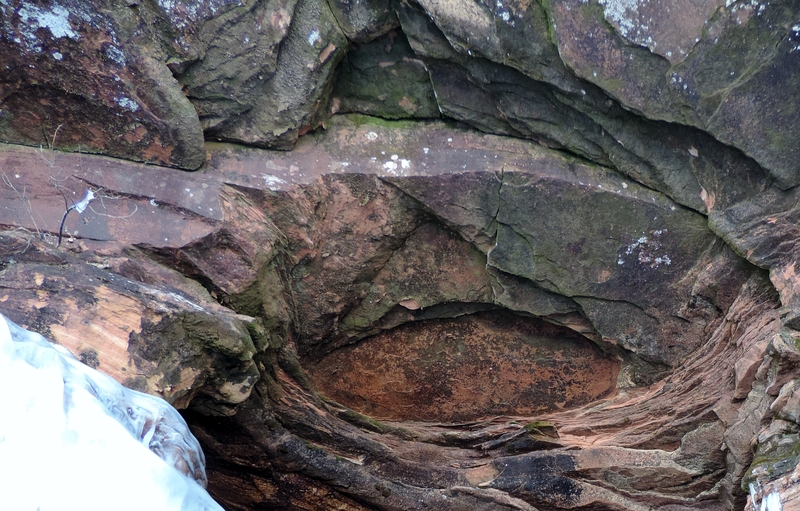 I realized the moment I saw the cliff that it was unique in its formation. Even as I stood in front of it, I wondered if I was not really looking down into it! See what you think. Does it seem that you are looking down into a pit? Now look at the picture before I cropped it. You can see by the way the icicles are hanging that the camera is looking up “at” the cliff rather than into a pit. I think one of the reasons this photo can be deceiving is the coloration of the innermost slab of rock…its color and its depth of color make all the difference. A cliff at Apostle Islands National Lakeshore. I enjoyed taking this little side track from my usual topic to this photo challenge. Now back to working on a bread that says “Spring”…and oh, how we need it! Piping-hot beef stew is one of my comfort foods, and we have had a winter that has begged for comfort food. What a long and hard winter this has been! The aroma from the Beef Stew and Dumplings I had started early in the day made the snow and sleet falling outside much less depressing. I love snow, but not in March! But there is hope…we also got to watch a St. Louis Cardinal pre-season game on television as the stew was cooking. Spring MUST be somewhere…just around the corner. And with that little personal note aside, we return to Charleston, SC one last time, for a visit to Fort Sumter National Monument. But first I want to say something about where we stayed while in Charleston. The Barksdale House Inn is a beautiful Regency style residence built by Thomas Barksdale sometime between 1778 and 1817. 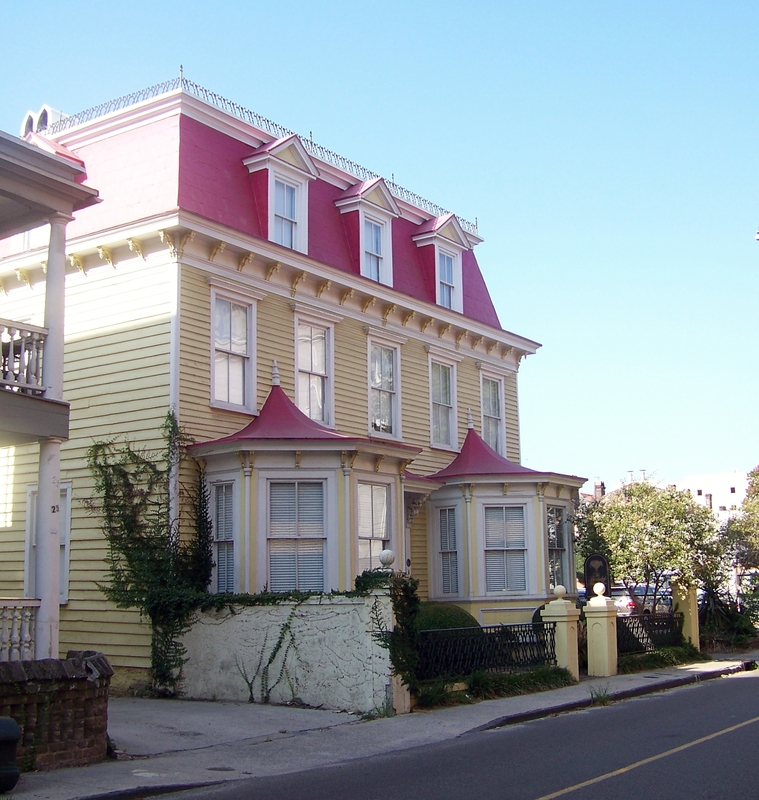 It is in the historic Ansonborough neighborhood, Charleston’s first suburb, also known as the “Bowling Green”. The Inn has 14 rooms furnished in period style with many antiques. The floors are original to the house. Behind the inn is a beautiful garden where we relaxed several evenings with a complimentary glass of sherry. It is moderately priced and is within walking distance of the historic district. Off street parking is also available. You can find out more about the Barksdale House Inn at their website, http://barksdalehouse.com. The Barksdale House Inn was a comfortable home away from home each evening after long days of sight-seeing. On our second day in Charleston, we made our way down to the Fort Sumter Visitor Education Center, where we boarded a ferry that took us out to the fort, which is situated in Charleston Harbor. 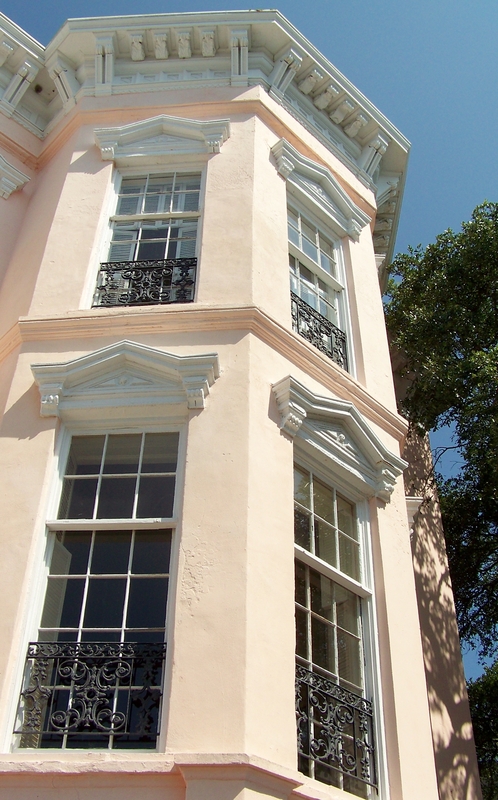 Walking in Charleston is always enjoyable and, once again, we took in many beautiful views of the city. We saw so many beautiful and beautifully restored old homes. One of the many churches in the “Holy City”. 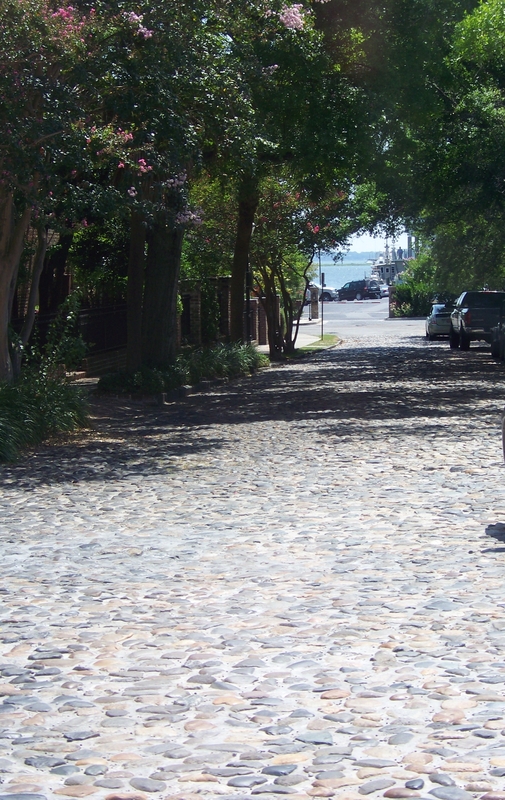 A tree-lined cobblestone street that leads to the harbor. 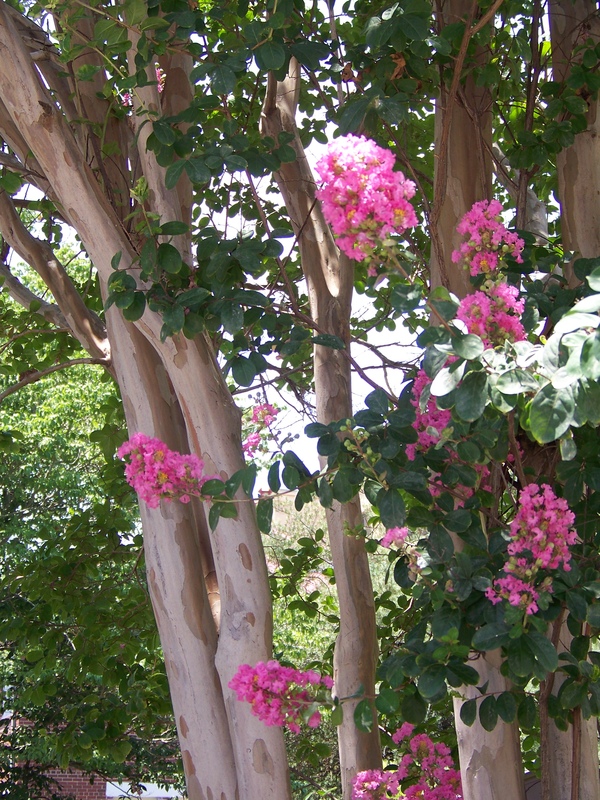 Beautiful flowering trees and shrubs all along the way. The ferry service that takes you to Fort Sumter allows for many more views of the city skyline and surrounding attractions. 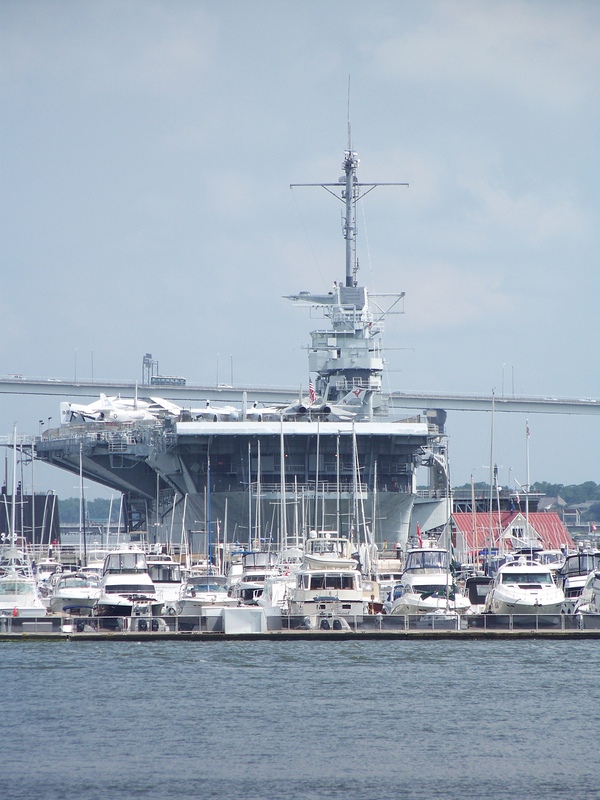 You can see the USS Yorktown, anchored in the harbor and open to visitors. The USS Yorktown anchored in Charleston Harbor. Approaching Fort Sumter on the ferry. 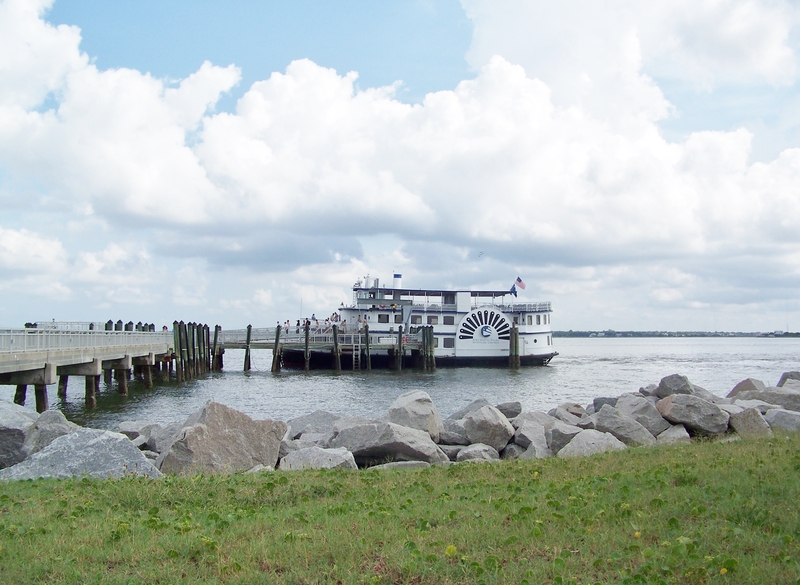 The Fort Sumter ferry at anchor while passengers explore the fort. A view of the Lowcountry from Fort Sumter. On December 26, after South Carolina became the first state to secede from the Union, Major Robert Anderson, commanding officer at Ft. Moultrie on Sullivan’s Island, moved his men to the yet unfinished Fort Sumter. He felt his troops would be safer at this location which is out in Charleston Harbor. He soon faced serious problems trying to resupply Fort Sumter with food and other necessities. We have always been taught that the first shots of the Civil War were fired in April, 1861. But by that time growing hostilities between the North and South had already resulted in gunfire. On January 8, 1861, as the ship Star of the West attempted to deliver much needed supplies to the fort, it was fired on by cadets at the Citadel. The shots historians have marked as the beginning of the Civil War were fired on April 12, 1861, when negotiations for the surrender of the fort to the Confederate Army failed. General P. G. T. Beauregard ordered the attack from nearby Johnson Island. The bombardment of Fort Sumter lasted for thirty-four hours and on April 13, 1861, Major Anderson surrendered the fort to the Confederate Army. 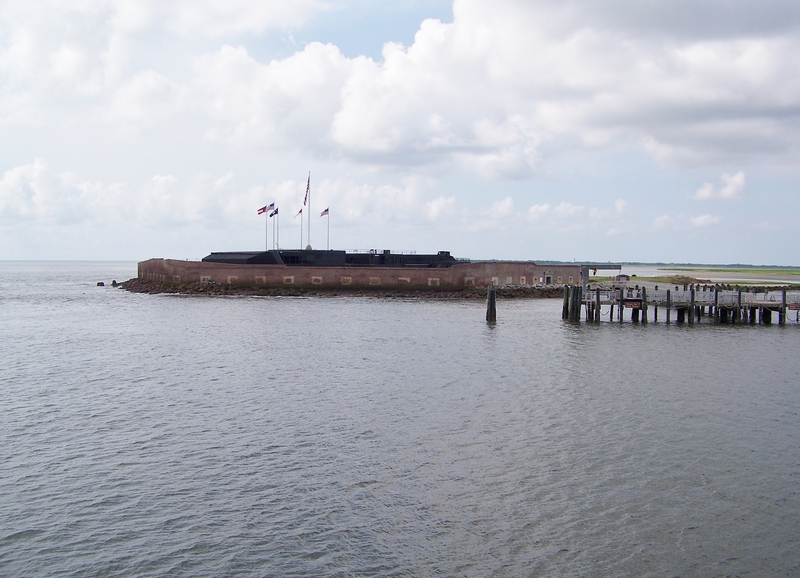 Fort Sumter was in ruins following the war and the US government worked to restore it as a military installation. From 1876-1897, Fort Sumter served as an unmanned lighthouse station, but it was never again engaged in combat. 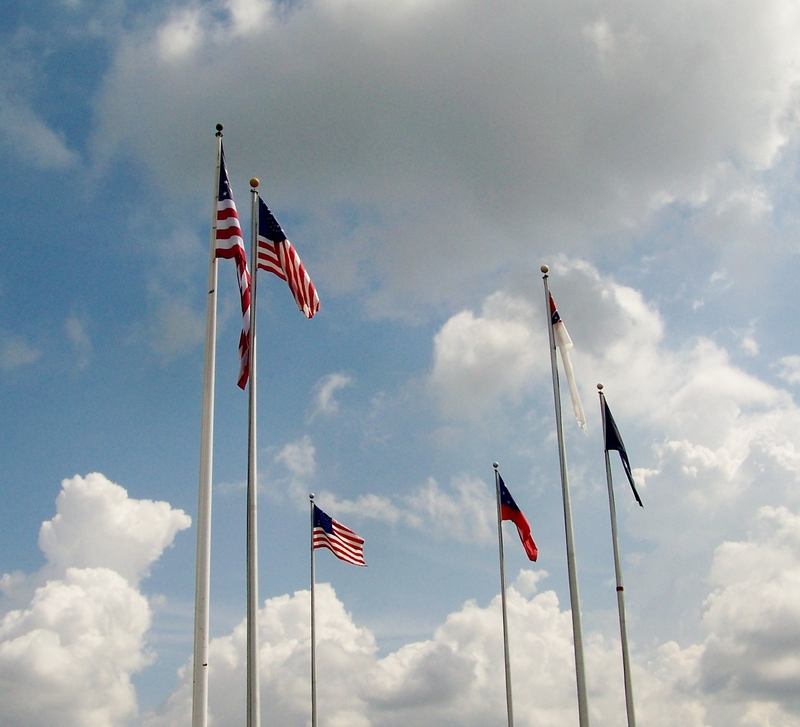 You can learn more about Fort Sumter National Monument by going to their website at http://www.nps.gov/fosu. 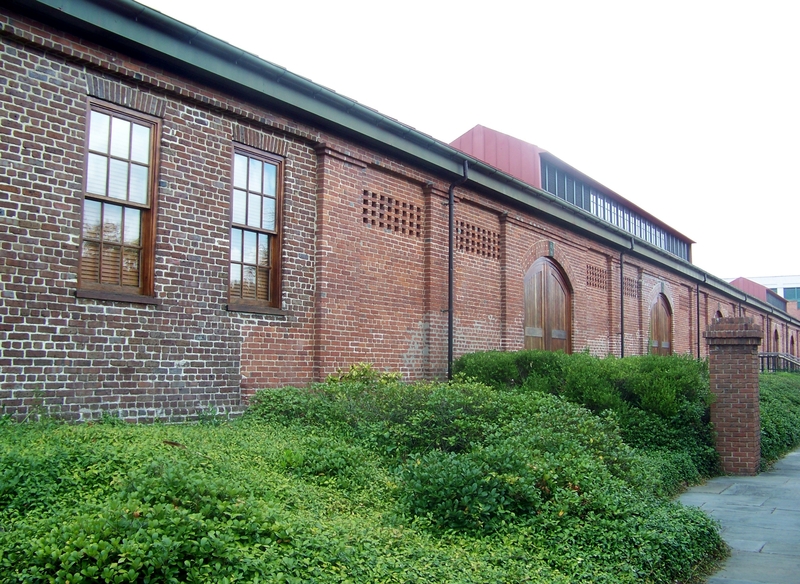 Before hostilities escalated as the Civil War approached, the troops at Fort Moultrie were able to attain fresh food supplies, such as meat and vegetables, from vendors in Charleston. These, together with the provisions provided by the government, ensured that the soldiers had good, nutritious meals. 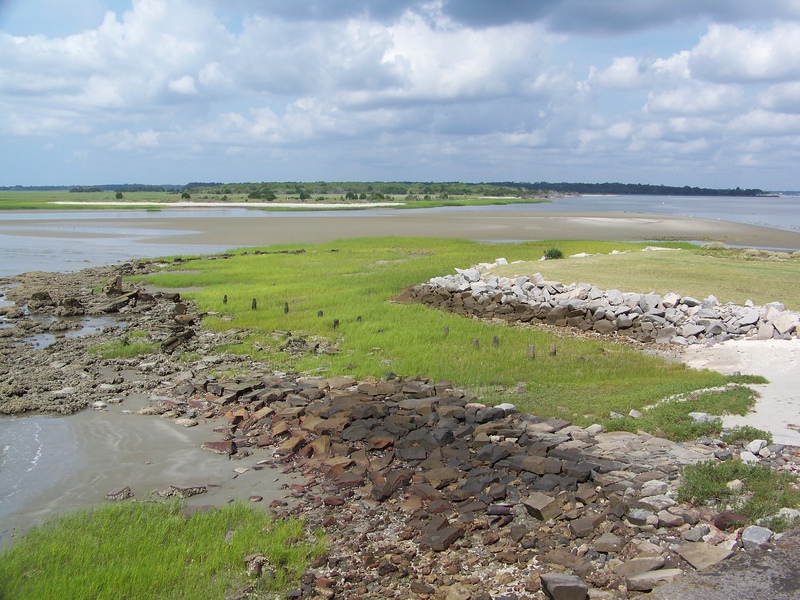 However, with the move to the unfinished Fort Sumter, obtaining good food and provisions became a serious problem. In January, the supply ship Star of the West had been fired on by cadets at the Citadel. By April 7, the men at Fort Sumter had only forty-eight hours of fresh food available. Even worse, they had no way of preserving any of the food. In addition, their supply of government issued provisions was running very low. But for our purposes– and because it tastes good–we will concentrate on the times they were able to eat well. 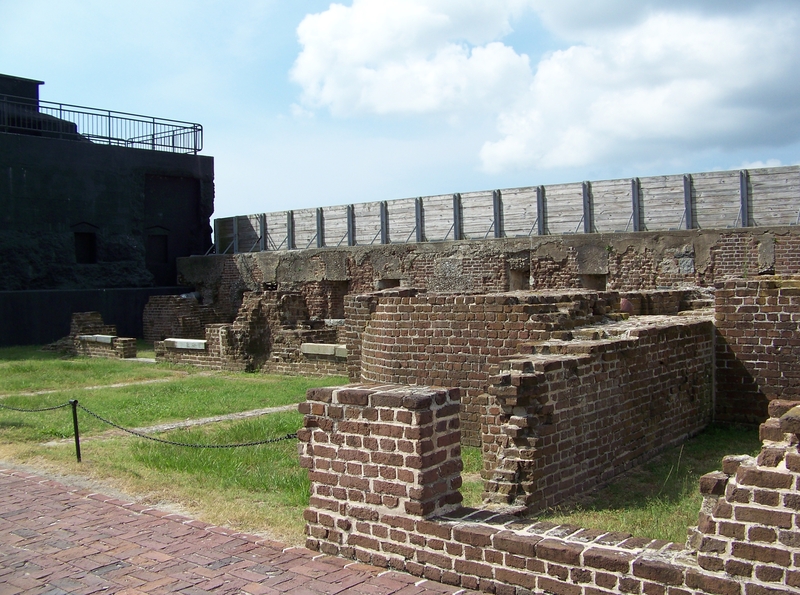 The men at Fort Moultrie would have had good meals with meat and fresh vegetables. They would have often eaten soups and stews. Many years ago, I purchased a cookbook entitled Blue and Grey Cookery; Authentic Recipes from the the Civil War Years. It was written by Hugh and Judy Gowan and published by Daisy Publishing of Martinsburg, PA. One of our favorite recipes from this collection is for a stew loaded with beef in a delicious gravy. This is the comfort food that makes this cold March day seem more bearable! I am sure you will agree that the primary reason it is so comforting is that it is a no-frills recipe that tastes just oh-so good. Enjoy! Comfort food on a cold, blustery day! Remove the meat from the bone and cut it into 1 1/2 inch cubes. Dredge the cut beef in a mixture of the flour, salt and pepper. *Use a piece of fat cut from the chuck to render fat for browning the meat. Brown the meat in the rendered fat. Add the tomatoes and enough boiling water to cover the meat. Cover and simmer for 2 hours and then add the onions, carrots and turnips. Simmer for 40 minutes more and add the potatoes. Simmer for 20 more minutes. Adjust the seasoning to taste. At this point you are ready to add the dumplings (recipe follows). After the dumplings are finished, you can make a gravy by removing the meat, vegetables and dumplings and thickening the liquid by adding a mixture of 1/4 cup flour and 1/2 cup cold water. This needs to be stirred constantly for 5 minutes. 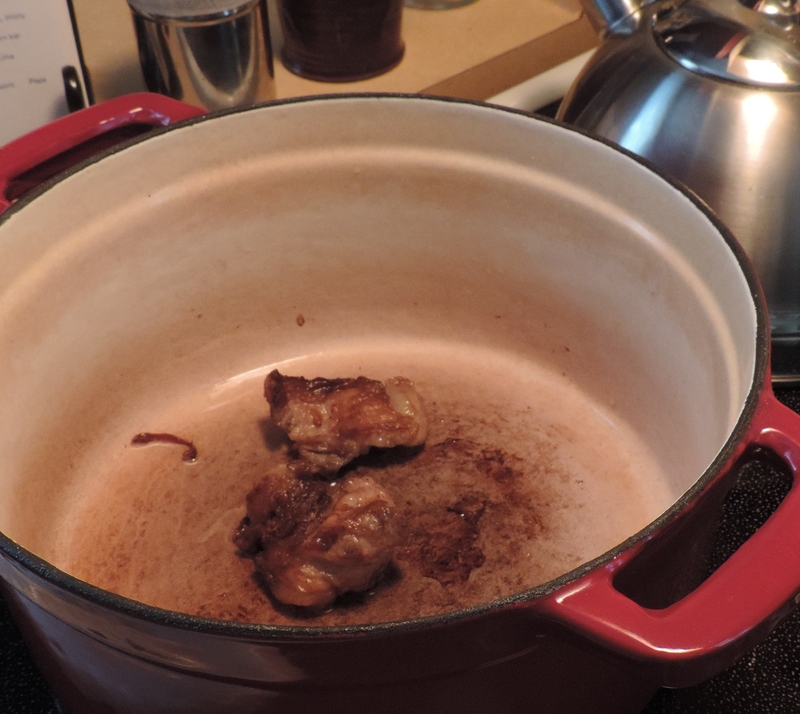 * Using the fat from the beef instead of an oil for browning your meat will make a great difference in your stew. Not only does it add beefy flavor, but it also gives you a head start on creating that very yummy brown food flavor. It is worth the effort. Sift the flour, baking powder and salt together and cut in the shortening. Add the milk and stir to make a soft dough. 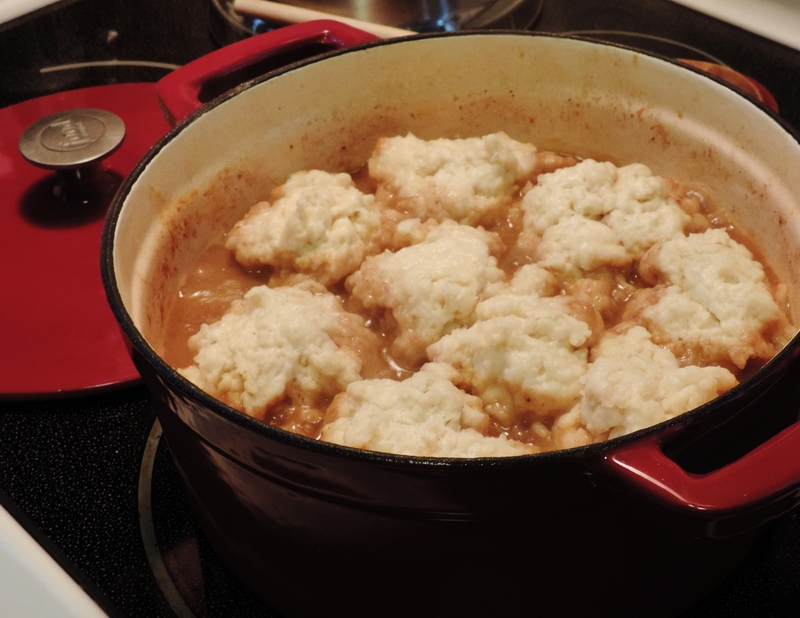 Turn up the stew to a rapid boil and drop the dumplings in by spoonfuls. The dumpling batter should not be immersed in the liquid. You can drop the batter on pieces of meat or vegetable. Cover tightly and cook rapidly for 15 minutes…don’t peek! 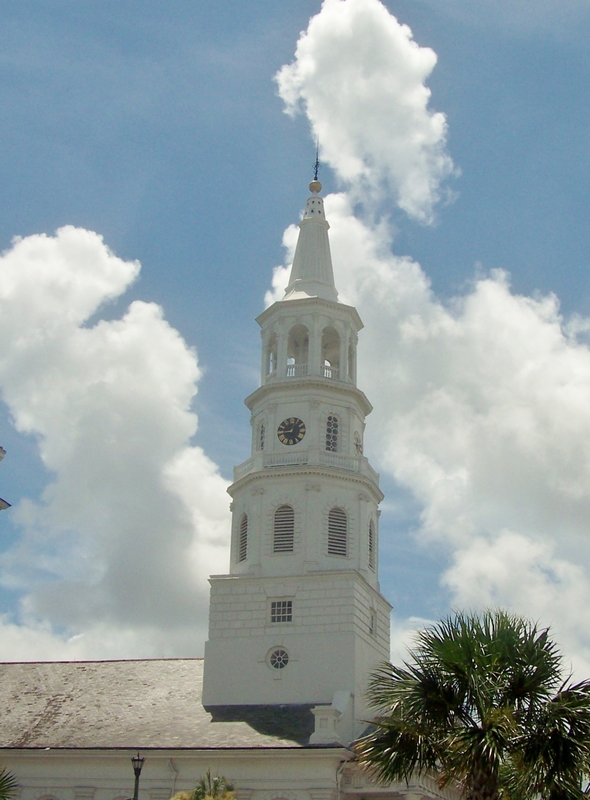 I have enjoyed sharing our visit to Charleston on my blog. I hope you might also take some time to make a trip to this great American city and enjoy its unique history and rich traditions. I also hope that you take the opportunity to try some good army food!